“Ardmore”, School Croft, Heaste Road, Broadford, Isle of Skye, IV49 9AQ. As you enter Broadford coming from the Skye Bridge or the Mallaig/Armadale ferry you will see the Vet Practice and the Claymore Restaurant on your right. Opposite is a minor road signposted “Heaste”. 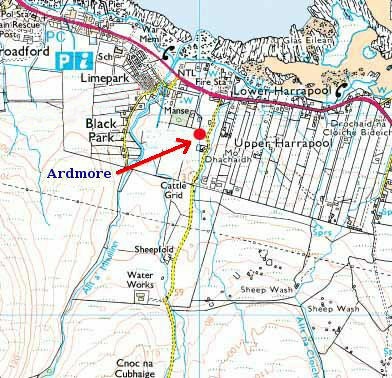 Turn into this road, go up the hill and “Ardmore” is the third house on your right. Parking is to the rear. The keys for “Ardmore” are secured in a key safe beside the back door. Instructions for operating the keysafe will be sent to you shortly before the start of your rental.